Kaminari Taiko's mission includes outreach to our community through workshops, performances, classes, and demonstrations. An important part of Kaminari Taiko's mission is to give back to our community. Through performances, classes, cultural demonstrations, and interactive workshops, we entertain and educate enthusiastic audiences. In addition to providing performances at local cultural events like the Houston Japan Festival, Kaminari often partners with local organizations to spread knowledge of Japanese culture and music. Kaminari Taiko's Apprentice-level students perform at community events as the Thunderstudies. We provide these performances free of charge with the goal of sharing taiko more widely throughout our local community. Kaminari Taiko is currently developing a Taiko in Schools program to bring taiko classes to local schools. We are planning to launch a pilot version of the program in the 2015-16 school year. We are currently looking for input from local educators as we design a program that can best serve Houston students and schools. Learn more about the program or sign up for our Taiko in Schools mailing list: Click here to visit the Taiko in Schools page. Kaminari Taiko celebrates Asian-Pacific American Heritage Month every year with the Thunderstudies! We visit multiple locations in the Houston area in May and provide a short program including a taiko performance and a hands-on opportunity for audience members to try playing the drums themselves. Thunderstudies presentations run about 45 minutes and are suitable for all ages. Applications for this tour open in February! We look forward to playing at libraries, schools, festivals, and any venue wanting to celebrating APAHM! 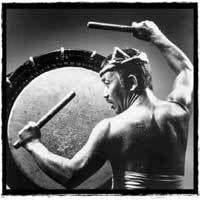 The Honorary Chairman of the One Heart Taiko Tour is Taiko Grand Master Seiichi Tanaka, founder of San Francisco Taiko Dojo and a world leader in the development of taiko as an art form and a powerful means of cross-cultural communication. [Grand Master Seiichi Tanaka, Honorary Chairman of the One Heart Taiko Tour] After founding the first taiko school in North America in 1968, Grand Master Tanaka has worked ceaselessly to preserve, develop, and share the culture and philosophy of taiko with the world. He has taught more than 10,000 students, many of whom have gone on to form over 200 taiko groups throughout North America. Grand Master Tanaka's work has been recognized many times, most notably in 2001, when the National Endowment for the Arts named him one of thirteen National Heritage Fellows, one of the nation's highest honors in folk and traditional arts. In 2003, Japan's Ministry of Foreign Affairs honored Grand Master Tanaka with its prestigious Foreign Ministers Commendation in tribute to his decades of work promoting peaceable relations between Japan and the rest of the world through the spread of the Japanese art of taiko drumming. Kaminari Taiko is honored to receive Grand Master Tanaka's support and guidance in creating and developing the One Heart Taiko Tour. We hope to continue his forty-year tradition of promoting the art of taiko drumming and educating people around the world in Japanese art and culture. On September 18, 2009, at the Grand Taiko Concert, the Consul-General of Japan publicly recognized Kaminari Taiko's cultural outreach efforts with a Commendation. The English translation reads, "The Consul-General of Japan extends his deepest regards to Kaminari Taiko in recognition of their distinguished service in contributing to the deepening of mutual understanding and friendship between Japan and the United States of America. Tsutomu Osawa, Consul-General of Japan at Houston."